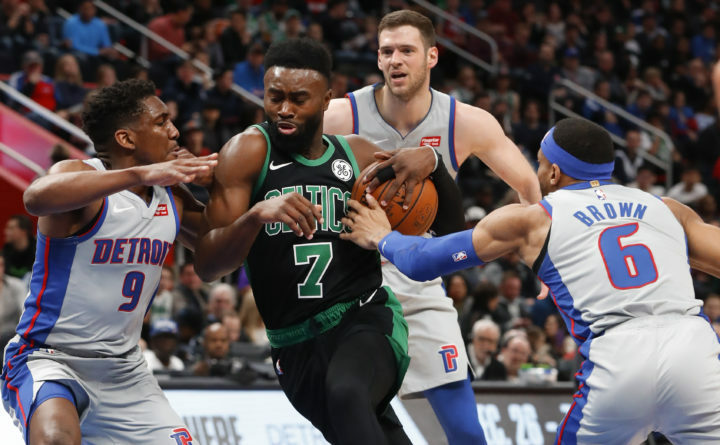 Boston Celtics guard Jaylen Brown (7) drives between Detroit Pistons guard Langston Galloway (9) and Bruce Brown (6) in the first half of an NBA basketball game in Detroit on Saturday. DETROIT — Jayson Tatum leaped toward the basket and Andre Drummond met him there, blocking the Boston forward’s attempt at a one-handed dunk. There would be no late surge by the Celtics in the final minutes. Blake Griffin scored 27 points and Drummond added 19 points and 20 rebounds to help the Pistons win 113-104 on Saturday night, snapping the Celtics’ eight-game winning streak. Detroit also ended its own six-game skid with a solid 48-minute effort. Both teams shot over 60 percent from the field in the first quarter, and the game was still tight at halftime, with Detroit up 57-56. Drummond punctuated his team’s 13-point run in the third with a dunk that put the Pistons ahead 76-66. Celtics: Marcus Smart was called for three fouls in the first 7:37. He did play a bit more before halftime and finished the game with 21 points and five fouls. … The Celtics were without Jabari Bird (personal reasons), Al Horford (left knee) and Guerschon Yabusele (right ankle). Pistons: Detroit was without Henry Ellenson (left ankle), Zaza Pachulia (illness), Glenn Robinson III (left ankle) and Ish Smith (right adductor). … Reggie Bullock was back in the starting lineup after missing five games with a left ankle sprain. He scored 15 points. One streak that did stay intact was Griffin’s run of 20-point games. He has at least 20 points in nine straight, the first Detroit player to do that since Richard Hamilton in 2008-09.